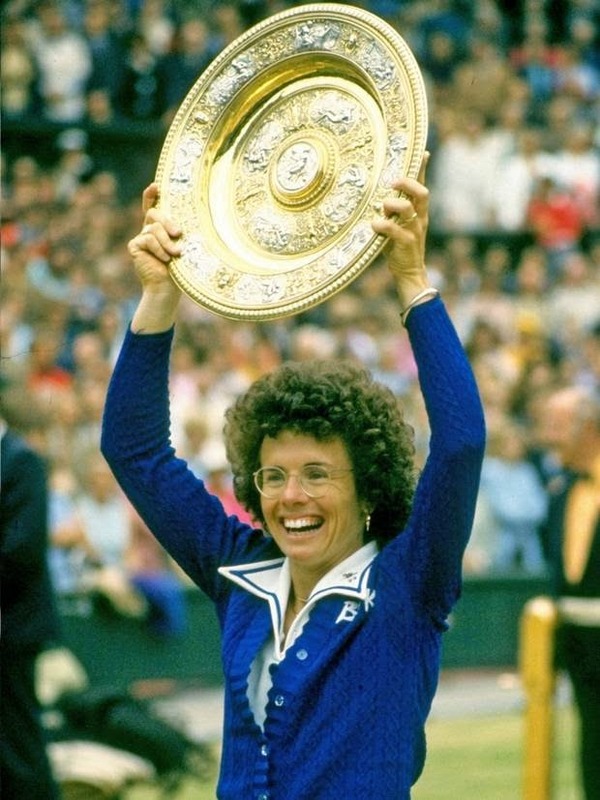 During her long career as a tennis player, Billie Jean King won six Wimbledon championships and four U.S. Open titles--to that, she added four Wimbledon doubles titles and a couple of U.S. Championship doubles titles, as well as singles and doubles championships at the French Open, the Australian Open . . . Well, you get the picture. But for those of us of a certain age, what we will never forget is that day in 1973 (September 20!) when Billie Jean King beat the crap out of Bobby Riggs in an exhibition match in the Astrodome that was billed as "The Battle of the Sexes." The staging was grandiose and silly (King entered the arena carried on a golden litter by buff and nearly naked men, Riggs pulled by a rickshaw powered by young women dubbed "Bobbie's Bosom Buddies"), but the event itself--just the idea of the event--was thrilling. So much so that even a non-sports-enthusiast like me can remember the match like it was yesterday. When King won that match, she won a victory for women and gender equality. And then, after she was outed in 1981, she became an important activist for LGBT rights. Here's a link to Don Van Natta's extended article, for ESPN, on the Riggs-King match, "The Matchmaker." And here's a link to Billie Jean King's Makers video, Billie Jean King: Champion and Activist. In this video, she talks about her playing career, her decision to have an abortion, and her (forced) coming out. Update, September 2017: A new film, Battle of the Sexes, has been released, focusing on the King-Riggs match. As noted by Manohla Dargis in her review for The New York Times, "Every so often an exceptionally capable woman has to prove her worth by competing against a clown." The film's release has been accompanied by a spate of articles on the match in addition to reviews of the film. I recommend the piece in The Daily Beast, Katie Baker's "The Battle of the Sexes: How Billie Jean King Beat a Misogynist Pig."